After launching the Amazon Great Indian Festival and Flipkart Big Diwali Sale, the 'Maha Cashback' cell has already been launched at Paytm Mall. Customers will get many great offers on the smartphone with discounts in the Grand Cashback Cell of PayTM Mall. The Paytm Mall cell will last till November 7. Maha Cashback Sale is getting bumper steamed deals on TV, Notebook and Air purifiers. Cashback up to Rs 16,000 is also being given to customers who buy new phones during the Patmi Mall sale. If the payment of minimum 3,000 rupees is made by Axis Bank Card, then 10% additional cashback will be availed. The maximum cashback amount is Rs 2,500 per card. Other Post You Might be Interested in. 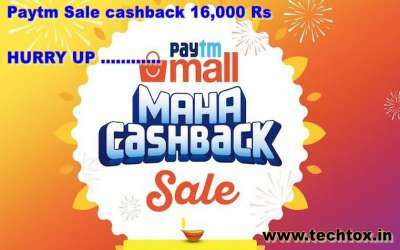 Offers in Paytm Mall Maha Cashback SaleCashback of Rs 6,000 on Samsung Galaxy Note 9 and iPhone X64 GB variant is given at Rs 84,500 and iPhone X 256 GB model 99,990 cashback of Rs 16,000. The iPhone 7 Plus's 128 GB variant is being sold at Rs 8,000 and the iPhone 6's 32 GB variant is priced at Rs 24,350. Also on iPhone 6, customers will get cashback of Rs 5,000. With cashback of Rs 6,500, 32 GB variants of the iPhone 7 are available for sale at 40,349 rupees in the PayTM Mall Great Cashback Cell. The iPhone 6S 32 GB variant will be available in the cell at Rs 29,699, but the handset of the Apple brand will get a cashback of only Rs 6,000. If you are not interested in buying Samsung Galaxy Note 9 or iPhone models, then you also know the offers received on Google and other company smartphones during the sale. The Google Pixel 2 XL 64 GB variant is being sold at Rs 43,478 with a cashback of Rs 7,000, 32 GB of Moto G6 Play for Rs 10,487. The user will get a cashback of Rs 1,363 on this handset. Oppo F9 Pro is available at PayTM Mall with a cashback of Rs 2,400. Vivo V11 Pro's 64 GB variant, which will be available some time ago, will get a Petty Mol voucher of Rs. 2,000. Paytm Mall can get an exemption on new phones by exchanging old phones in Maha Cashback Sale.